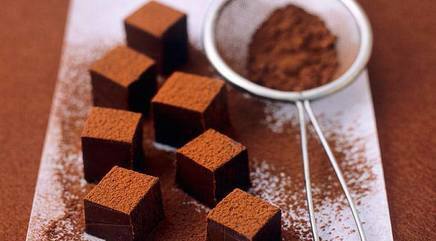 Celebrate National Anisette day with these Chocolate Truffles With Star Anise! Line a 8" x8" tin with non-stick baking paper. Chop both chocolates very finely. Put the cream into a pan and bring to a boil. Remove from the heat and place the tea bags in the cream. Infuse for about 10 minutes, then squeeze out well into the cream and remove the tea bags. Reheat the tea-flavored cream and add the chocolate and star anise. Stir until the chocolate melts, then allow to cool slightly. Pour the mixture into the tin, cover with cling film and leave to set for about 24 hours. Cut into 50-60 even cubes and dust with cocoa powder.